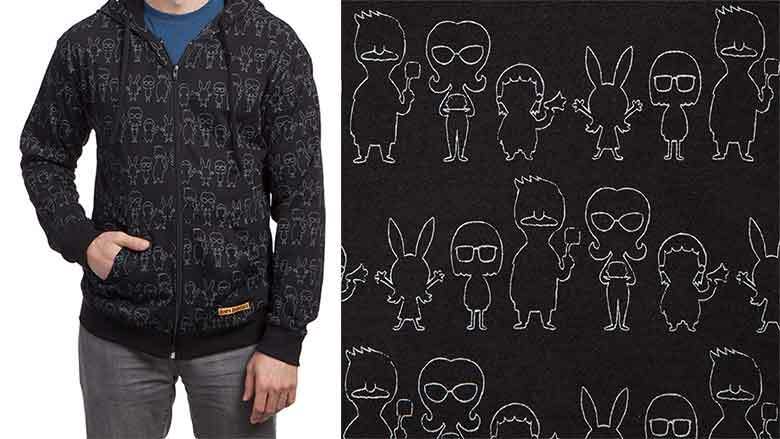 Bob's Burgers Hoodie: Blackboard Characters Zip-Up | Nerd Much? Since that fateful Sunday night, January 9th 2011 when Bob’s Burgers first premiered, the Belcher family has been delighting audiences with their punny, sarcastic antics. Premiering on Fox, with the infamous “Human Flesh” episode, the series quickly caught on with audiences. Taking off in viewership in its second season, the animated sitcom eventually began airing on Cartoon Network’s Adult Swim, and began syndication with local stations in 2015. And here we are into season 8, and the show continues to gain momentum. With such critic acclaim, it’s easy to understand why fans have an endless appetite for all things Bob’s Burgers, which is why we can’t get enough merch, like this Bob’s Burgers hoodie from ThinkGeek. Check out this truly fitting way to show your Burger Boss pride, a full-length zipper hoodie designed in the same style of Bob’s Burger of the Day Chalkboard. From the “Pepper don’t preach burger” to the “Salvador cauliflower burger”, the chalkboard is a small part of the show that holds a large place in our hearts, so why not show off that classic chalkboard style? This officially licensed merchandise is a ThinkGeek exclusive, and it’s guaranteed to display your love of this Emmy Award-winning animated series in true Belcher class. This full zipper black hoodie features the chalkboard white outline of each member of the Belcher family in surprising detail, including Bob’s mustache and spatula, Linda and Tina’s glasses, Gene’s megaphone, and of course Louise’s trademark ears. Stash your other Bob’s Burgers merch in the kangaroo pockets, while enjoying the ribbed cuffs and waist, as well as the drawstring neck. Made with 100% cotton this hoodie is priced at $39.99 and is currently in stock. So, sink back in comfort with this awesome zip up hoodie and queue up the 22 best Bob’s Burgers Episodes. Buy the Bob’s Burgers Zip-up Hoodie here.